This activity also incorporates the Self-Assessment Modules (SAMs) credits required by the American Board of Pathology’s Maintenance of Certification (MOC) Program. Physicians may claim up to 7.25 SAM credits for this activity. Claimed credit should commensurate with the extent of participation in the activity. 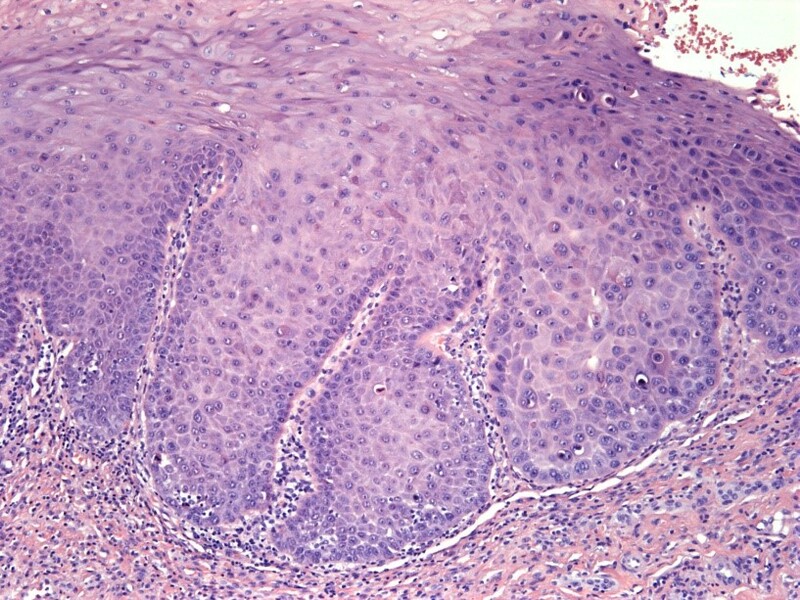 b) Histologic findings can include features similar to lichen planus. c) More common in tobacco smokers. d) More common in men than women. 5. 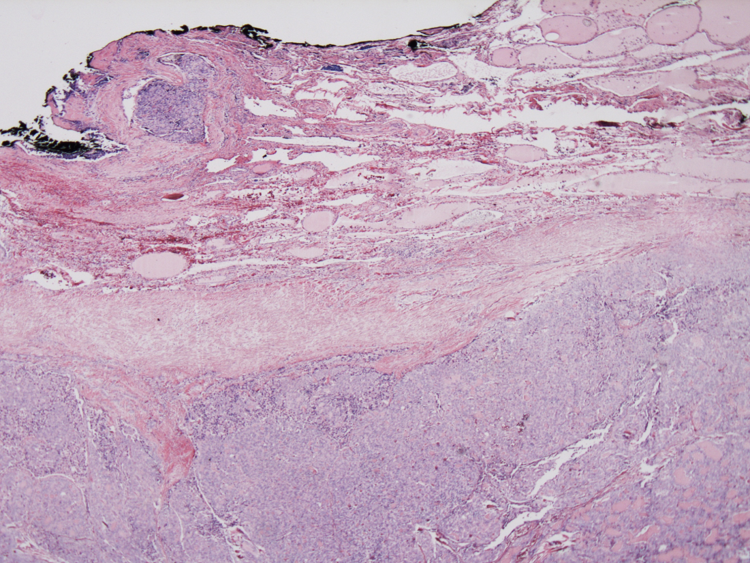 Which immunostain should be part of an initial immunohistochemical panel for a sinonasal small round blue cell tumor? a) Test for low risk HPV types. b) Specific test for high risk HPV. c) Test with a panel which includes tests for low risk and high risk HPV types. d) No need for further testing. Include a note that this is most likely from a oropharyngeal primary. a) It is generally accepted that more than 50% of this entity manifest the MECT1-MAML2 fusion. b) MECT1-MAML2 fusion represents a specific prognostic molecular marker in MEC. c) Fusion in MEC represents a distinct mechanism in the development of this entity. d) Detection of MECT1-MAML2 provides useful information for MEC diagnosis but is not associated with differences in survival outcomes. a) MYB-NFIB; MYBL1-NFIB; MECT1-MAML2; MECT3-MAML2. a) Adrenal cortical carcinomas are the most common endocrine carcinoma. b) Adrenal cortical carcinomas most commonly affect children. d) The same criteria are used to diagnose adrenal cortical carcinomas in adults and children and in conventional and oncocytic adrenal cortical neoplasms. c) Germline TP53 mutation is never seen in association with adrenal cortical carcinomas in individuals over 18 years of age. 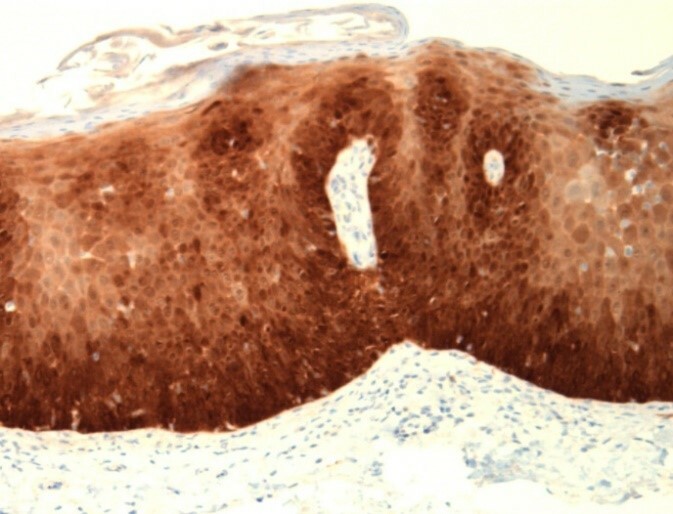 d) Only sporadic TP53 mutations are identified in adrenal cortical carcinoma is in children. a) Both benign and malignant adrenal cortical neoplasms can by cystic, although malignant cystic adrenal cortical neoplasms are quite uncommon. b) Only benign adrenal cortical tumors show cystic change. c) Only malignant adrenal cortical tumor show cystic change. d) Pheochromocytoma is are never associated with cystic change. d) Translocation involving NAB2 and STAT6. a) Different mesenchymal tumors can share the same gene alteration or translocation. Therefore, it is always important to correlate molecular results with histology. b) In the 8th edition AJCC, all sarcomas are staged the same regardless of site including those arising in the head and neck area. c) Sinonasal biophenotypic sarcomas are spindle cell tumors with neural and myogenic differentiation and with the most frequent translocation involving PAX3 and MAML3. d) The scalp is a frequent site for sarcoma skin metastasis. a) The tumor has extensive nuclear clearing and grooves. b) The tumor has a capsule of variable thickness. 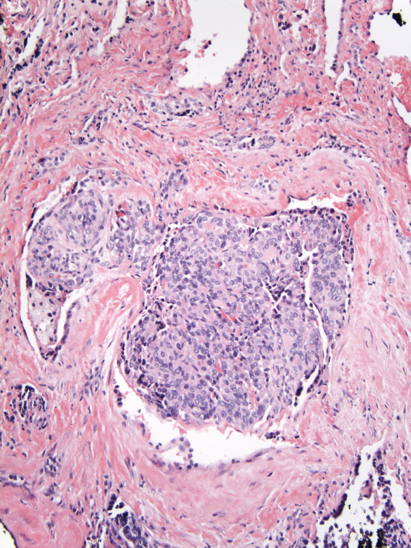 c) The tumor has small areas of papillary architecture. a) The diagnosis is NIFTP. b) The tumor has a propensity to spread to distant sites such as bone and lung. c) The tumor has a propensity to spread to lymph nodes. 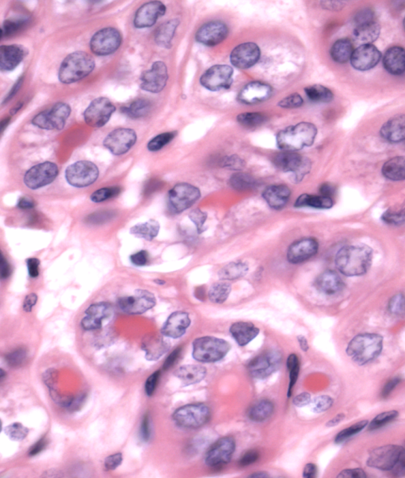 a) The Turin proposal defined poorly differentiated thyroid carcinoma as a tumor with a solid/trabecular/insular architecture that has nuclear features of PTC, and has mitoses, necrosis, or convoluted nuclei. b) The criteria put forth in the Turin proposal cannot be used for oncocytic tumors since oncocytic tumors always show a solid architecture and increased mitotic activity. 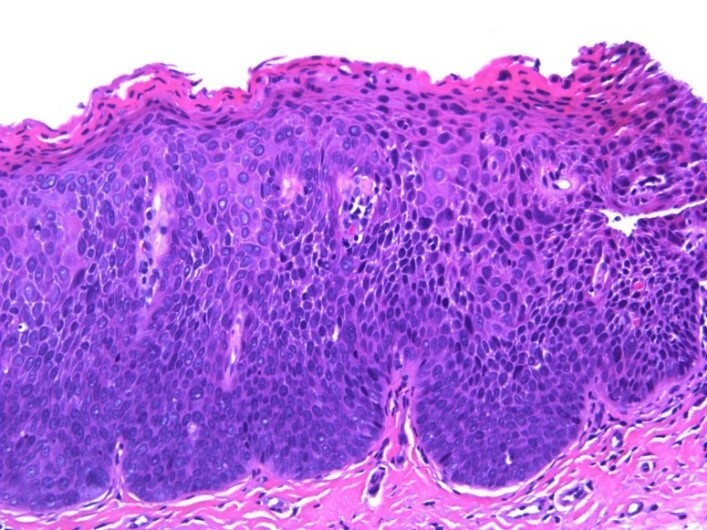 c) TTF-1 is usually positive in poorly differentiated thyroid carcinoma, but may show reduced positivity compared with well differentiated thyroid tumors.